Are you considering a career in Higher Education? The Higher Education sector offers a wide range of employment opportunities, in particular in management and leadership. You might not have considered it before, but why not think about now as a career possibility. The Ambitious Futures programme allows you to gain valuable experience, while earning. Have you graduated in the last 5 years? Did you get a 2.1 or higher in any subject? If you’ve answered “yes” to all three, why not try the Ambitious Futures programme? 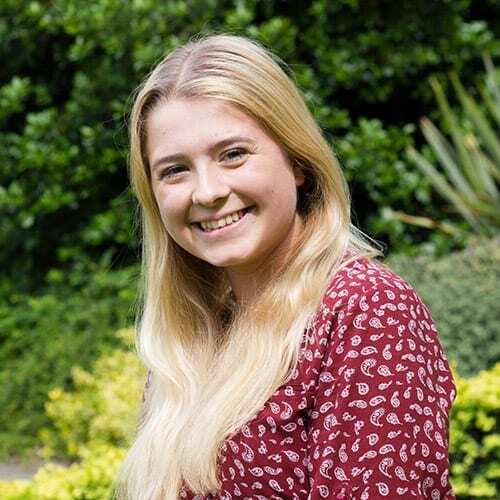 I chose to apply for the Ambitious Futures scheme because I was unsure of what I wanted to do, but knew I had an interest in the Higher Education sector and wanted to learn more about it. It also allowed applications from any field of study, which I found many other schemes didn’t offer. I wanted a challenge and not to be bored, and so far I haven’t been disappointed. I am currently doing my first placement in the Development and Alumni Relation’s Office and I’m loving it! I am learning a lot, not just about the HE sector, but also about my own working style – the online leadership and management programme you undertake as part of the scheme really helps with this. I’m also realising that the skills I’m learning will be applicable in any management situation, which is really reassuring if I do decide the HE sector isn’t for me at the end of the scheme. I am also getting to travel all across the UK for various workshops and events as a part of the scheme which is great as I’m getting to see parts of the UK I have never seen before. The workshops and events are great also as you get a chance to meet all the other people on the Ambitious Futures scheme across the UK – this has helped to build a great support network, and led to me making lots of new friends! My advice would be that if you are thinking of applying just go for it – you have nothing to lose! Also if you make it to the video interview stage make sure you read lots of online advice before attempting it – it’s certainly an interesting experience! The application process is quite long, but you will learn a lot from it and if you are lucky enough to be successful you will be taking the first step on an amazing scheme that will help you fast-track into management. As a student, I always loved the university environment. I liked the variety, the rate of change and the possibility – you surrounded by people who have the skills, knowledge and motivation to make anything happen! When I graduated from my Masters, I knew the Higher Education sector was where I wanted to work but I didn’t know exactly what I wanted to do or how to get into it. I came across Ambitious Futures one day through a google search and am so glad I did. It’s been perfect for me. Three placements in two different universities have given me an insight into how a university works. I’ve gained experience of managing my own projects, dealing with senior people and controlling budgets – skills valuable in any sector! My first placement within the Careers Service at the University of Dundee gave me opportunity to lead a project from start to finish through organising a leadership and development programme for 45 students in Dubai. I was even lucky enough to be able to accompany students on the trip! For my second placement, I worked in the University of Glasgow’s Estate Strategy team. The team were in the middle of delivering a billion-pound campus redevelopment plan. As well as supporting the team day to day with the project management of three new major buildings on the campus, I had the opportunity to lead on an audit of student wellbeing across the university’s 11 student accommodations. In my final placement within the School of Nursing and Health Sciences, I’ve had the opportunity to work with senior level staff across the university to conduct a review of the organisation’s health and wellbeing initiatives. As part of Ambitious Futures, I’ve completed the Emerging Leaders and Managers Programme (ELAMP) with the University of Melbourne, which has enhanced my knowledge of the sector. I’ve made good friends with the other trainees on the programme through with regular ELAMP group coaching sessions. Overall Ambitious Futures is a great opportunity. I’ve developed so many useful skills, gained valuable experience and strengthened my conviction that the Higher Education sector is where I am supposed to be! I initially chose the scheme because it is one of the few graduate schemes that allows you to gain insight into a variety of different roles in departments across the HE sector. For someone like me who was initially unsure what area in Higher Education I would like to pursue my career in, the scheme was perfect. I also enjoyed the prospect of working at another HE institution next to the one I graduated from, not only to experience living in another city, but also to learn more about how other institutions may ‘tick’, and how much it can differ from your own institution. Given that the scheme is split across 3 different placements, I have learned to adapt very quickly to a new environment and team, as well as built up on my communication skills and managing different stakeholder expectations. You really do get thrown into a project quite abruptly at times, but I thrived on that challenge and being appreciated for the work you put in each time can be really rewarding, not to mention the plethora of contacts you will make across two universities! Another aspect I found hugely beneficial about being on the scheme is your support network of AF trainees across the country. I thoroughly enjoyed getting together every so often for the ILM sessions and catching up with everyone. You really do make friends for life there as well, and having this incredible network of other trainees to work and socialise with is simply invaluable and very unique to the scheme. I applied for the Ambitious Futures graduate scheme because I wanted to pursue a career in the Higher Education sector and saw the graduate scheme as an opportunity to learn more about the sector, obtain valuable administrative experience and learn where I could best contribute. My experience of Ambitious Futures was really positive. This graduate scheme provides you with a network of fellow trainees which is extremely valuable when pursuing a career in the Higher Education sector; the opportunity to complete projects which will have an impact on your institution (and another institution for the second placement); and the chance to complete a qualification in leadership & management. This provides you with the opportunity to enhance your own CV; the skills you gain from this graduate scheme are not specific only to the Higher Education Sector and will open doors in other areas. I completed projects in the following areas: work on mentoring for Athena SWAN; ensuring compliance with the Competitions & Markets Authority requirements (at the University of Aberdeen); and policy management. Through the placements I was able to build on my knowledge of the Higher Education sector, discover where I wanted to work, and, ultimately, utilise the experience to get the job I wanted.